Security forces carry out search in Gush Etzion, discover firebombs and IDF helmets and shoes. Border Police and IDF soldiers IDF uniforms, shoes, and other gear in the Arab town near Beit Lechem (Bethlehem). In their search of a home, the security forces found a large amount of IDF uniforms, helmets, shoes, and other articles of clothing. They also found six firebombs ready for use and an Airsoft gun, which had been made to resemble an M-16, and other weapons. A Border Police spokesperson emphasized that weapons such as the homemade M-16 are common, and several terror attacks have been carried out using them. Every night, Border Police and IDF carry out dozens of searches and arrests in Judea and Samaria, as part of the efforts to foil terror attacks before they happen. Many of these are in coordination with the Shabak (Israel Security Agency). Last week, Border Police officers entering an Arab home in Hevron insisted a woman put her baby down - and were handed a gun which the woman had hidden under her shirt. In March, the IDF closed down secret and illegal Arab weapons factories in Judea and Samaria. 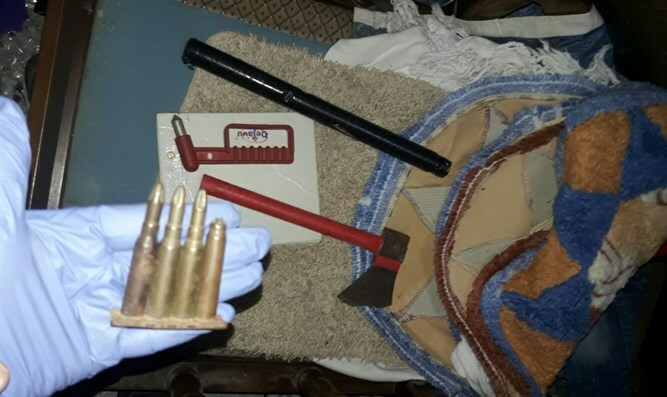 In May, the IDF confiscated illegal weapons and managed to arrest a terrorist at the same time, and in July, security forces caught illegal Arab weapons dealers in Samaria.